JoAnn Hathaway is a practice management advisor for the State Bar of Michigan. She previously worked as a legal liability claims director, risk manager, paralegal, and legal administrator. She holds undergraduate and graduate degrees from Spring Arbor University and Central Michigan University. She is an Adobe Certified Expert, is a Certified Clio Product Pro, and holds software certifications in LexisNexis Time Matters and Billing Matters software. She is a Registered Professional Liability Underwriter, a licensed property and casualty insurance agent, and the author of the ABA publication Legal Malpractice Insurance in One Hour For Lawyers. She is active in the ABA Law Practice Management Division, serving on the Publishing Board and Law Practice Today Editorial Board, and is a frequent speaker on law firm technology, insurance, and risk and practice management topics. 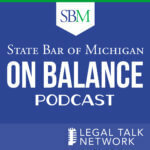 State Bar of Michigan President Lawrence Nolan on sustaining efforts to improve diversity within the judiciary. Ari Kaplan on helping attorneys develop their companies and what lawyers can learn from successful organizations in other industries. Shenique Moss on upcoming events available to Michigan’s young lawyers and her experiences with the Young Lawyers Section.